OMEGA’s compact and low cost RH1362P is ideal for applications requiring display and printing of relative humidity and temperature measurements. 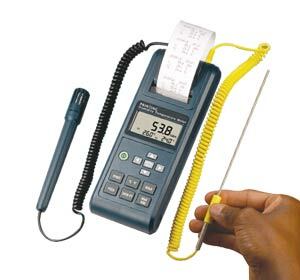 It offers a triple display to show the temperature and humidity from a handheld probe and can display data from a separate K type thermocouple connected via a standard SMP type miniature connector to the T2 input. A built-in thermal printer makes hard copies of the RH and temperature measurements, which can be taken at selected intervals. Parameters printed are time, date, temperature, RH and channel number. Battery powered or optional AC adaptor. Free Thermocouple Included: This model includes a free 1 m (40") Type K insulated beaded wire thermocouple with subminiature connector and wire spool caddy (1 per channel). Nota: Comes complete with temperature/RH probe, beaded wire Type K thermocouple, carrying case, 6 "AAA" alkaline batteries, two rolls of thermal paper and operator's manual.